"I got work as soon as I subscribed & continue to receive work from lots of agencies. I’m very busy so SFS is perfect; it allows me to access all agency details saving me valuable time & money. I love the fact that all the required information is at my fingertips & agencies get to see my profile. I have recommended SFS to all my friends as the service is such a valuable tool for anyone who works in promotions. "Thanks to SFS I am doing the job I LOVE. I have been a member for years and have gained lots of great work, as well as built up fantastic relationships with agencies. By always updating my availability, keeping on top of my profile and respond to agencies Job Alerts, I have had a very successful couple of years. SFS is not only the number one service for promotions, it is also a site that I can trust 100%"
"I was a little disillusioned at first by the lack of response I had from some of my applications. I soon learned how agencies worked and used the rating system; this I feel has really boosted my chances further. I have worked on so many campaigns, ranging from: technical trainer, sampler, Team Leader, Event assistant & Merchandiser. I have worked hard and been very conscientious about my work performance; this has been recognized & I have been awarded from agencies." SFS is certainly the central portal for promotions. I would not be able to work full time in this industry if it wasn't for SFS. I've worked on some fantastic campaigns which have been advertised on here and I’m now working with some brilliant experiential agencies linked through SFS. "I was dubious about paying the fee to join SFS, but one morning- 2.00am to be precise, I decided to take the plunge and subscribe. By 10.00am I received my first call from an agency offering me work. I have been a member now for 2 years and work with some great agencies." "I was recommended to join SFS, so I decided to subscribe and saw a vacancy which was exactly what I was looking for. This was the first and only job I applied to and was offered a 6 month contract, which I am currently working on. Thanks! "I got the 1st job that I applied for within 15 minutes, so I am thrilled with the site!" "I received a call from an agency within the first day of joining SFS. Very pleased, worth the £17.50 already!" "I have been with SFS for over a year and was introduced by a friend. It has opened so many doors for me in the PR industry. I am now registered with over 12 agencies, get offered regular work and can choose what suits me best as I am a full-time student. I have also recommended SFS to friends and they have also got a lot of work through the site." "Through my RATINGS I have been contacted by numerous agencies and worked on some amazing jobs. Roadshows, tours and festivals are just a few. I urge all staff to get their ratings raised because agencies DO look at them to help choose the best staff! Thanks stuckforstaff I can't wait for future jobs to kick off. SFS is a great tool. Knowing SFS is a genuine tool for promotional agencies as well as promo staff, there is no likely hood of getting viruses when using the SFS webpages. I have been with SFS since they began and it has been a really useful tool. I direct agencies to my SFS webpage, so they can see what I have been working on and to my rating, which in itself should speak volumes that I am an asset to any agency. Whenever I send a CV to a new agency, I always tag in my SFS link so agencies can see exactly what they are getting with me. I believe that through doing this it has enhance my employability with many agencies and shows my professionalism as I am paying a subscription to actively gain work. It is always nice when you receive a phone call or an email from a new agency This goes to show that there are always agencies actively looking for staff and proves SFS does work! "Signing up with SFS has been an amazing platform to some amazing work. I have requested ratings with every job I have done and being in the promotional/experiential industry for 8 years my ratings have really advanced me into more work. Agencies call me up wanting to book me, because of my high ratings. I'm hardly ever available due to my high ratings." "The SFS rating system has allowed me to gain recognition as an excellent brand ambassador. The Ratings provides a true measure against other staff. They have strengthened my profile and increased the volume of work I receive. Agencies benefit from knowing that I am reliable and worthy of future work offers." "I have been flat out with work thanks to SFS! It's a must for anyone in the industry, even if you are experienced and registered with many agencies. I advise newbies to take advantage of the full service, it’s a great website and well worth the money. You guys as a team are fab- I have been with SFS for a few years and will carry on my membership and will continue telling people to join." "Ever since I decided to subscribe to SFS, I have been very happy with the services and I have recommended you to many people I have worked with, who didn't realise you are out there. Keep up the good work!" "I use SFS regularly and am extremely happy with the easy use of the site and that I get regular work. It is a very reasonable price taking into consideration what I earn from agencies who contact me via the site." "SFS has without doubt proven itself time again to be invaluable. It's the trusted, reliable and ethical method used by agency and staff who value great jobs and great workers. The added benefits , help and services offered and the union to which we should all belong is simply a necessity. Thank you SFS, once again, you go the extra mile FOR US ALL!" 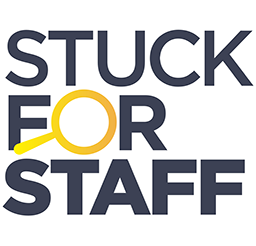 "Really useful to have all agencies on StuckForStaff.com. It has saved a lot of time"
"Thanks to StuckForStaff.com I don’t struggle to find and receive work. The system certainly saves me time and I couldn’t and wouldn’t live without. "I get at least 3 calls a week from agencies through SFS. In the summer months, I’ve noticed that I’m being booked for even more work than usual. I work part-time in Sainsbury’s, so it’s great that I can update my availability every week and get extra work when I have any spare time"
"I compare SFS to my Internet banking account. It’s easy to use, quick and very reliable; I would say that 50% of the work I get comes from SFS. I received a call out of the blue over 5 years ago from an agency and have had consistent work as an Event Manager for their campaigns. I also find the updates from SFS very useful; they often prompt me to update my, ratings, CV and profile which helps me to always get the best from the service. "When I first heard about SFS, I was unsure as to whether I should enrol, even though the cost was very low. I have to say that I shouldn't have been concerned. Receiving constant updates of opportunities has been really useful, and I have worked constantly (7 days a week constantly) for the last 15 months. I would recommend SFS to anyone that is looking for additional work and more income." "Thank you for fixing me up with all that work, I am currently working on organic farms in Canada. If it wasn't for you guys I wouldnt be here. I will definitely log back in when I get back to the UK. Thanks again,"
"Many thanks for your help and awesome website - it's helped me a lot over the past four years!" "The Central Rating System has helped me considerably at interviews/castings; agencies are always extremely impressed because they certainly set me apart from other staff. The Ratings clearly indicate which agencies I’ve worked for and the type of work I’ve done, proving to agencies, I’m very reliable and excellent at my job. "I was made redundant after 7 years . I applied to various agencies and online recruitment but no one ever got back to me. An ex colleague recommended SFS. Within a couple of days I saw the Sainsbury Double Up Nectar Points BA position. I applied and got 9 days work from ODM. I don't have Merchandising or Tactical experience so this was a great boost for my confidence. I will keep checking your site for further work. Thank You."